I haven’t used the Michelin Pro Race 4, but I’ll include it because it comes out very well in the above test. 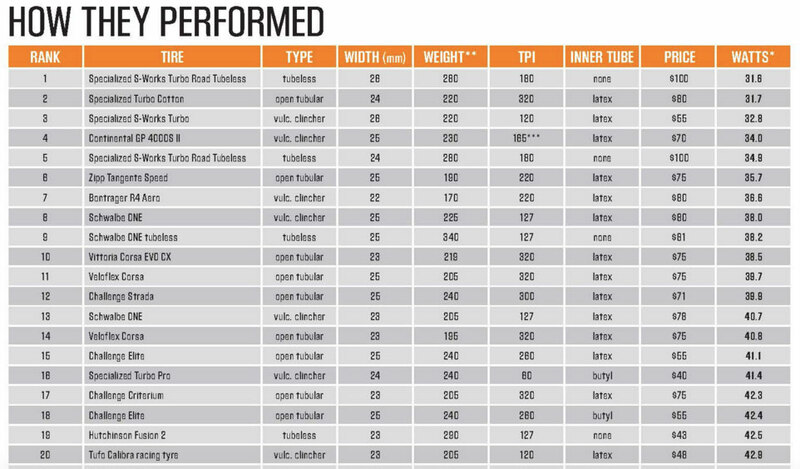 With very good puncture resistance, it still scores very well in terms of weight and rolling resistance. It also comes in a model Pro grip, which the manufacturer claims offers 15% better grip in the wet and has 15 g extra of Aramid layer of puncture resistance. I tested this for 3,000 km one recent summer. 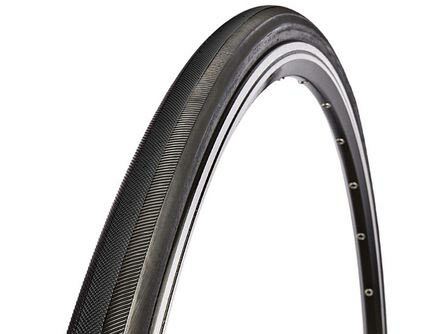 It is a slick racing tyre, weighing only 195 grams and has low rolling resistance. Grip in the dry is very good. It performed less well in the wet, so as usual be careful on wet descents. However, I’ve had no major problem with lack of grip. 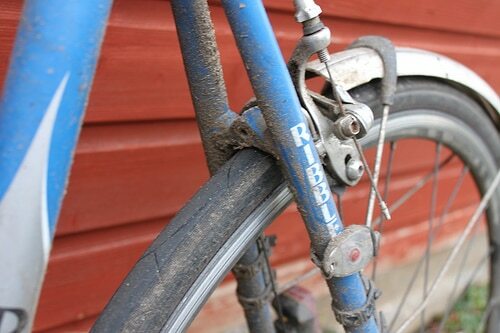 I used the tyre on hilly rides across the Lake District, Yorkshire Dales and Oxfordshire. It performed well on gritty roads and the ascents and descents of Wrynose pass / Hardknott pass – despite tricky roads. I’ve never had a road tyre which fits on so easily. It is very easy to work with. The rubber feels quite smooth and supple. Definitely no tyre levers are needed to fit onto the wheel. No rear wheel puncture in 2,500km – lucky or good tyre, not sure!. It did wear relatively quick, so I changed before my luck ran out. I’ve probably done more miles on Continental Grand Prix 4000 than any other tyres. A few years back I did have a problem with splitting sidewall tyres. But, I still went back and bought some more . Since then I haven’t had a split in sidewall. Either the model has improved or it was bad luck with the old model. – GP 4000 – lightest version. – GP Four Seasons – extra 35 g layer of puncture protection. So you can decide which is most important. 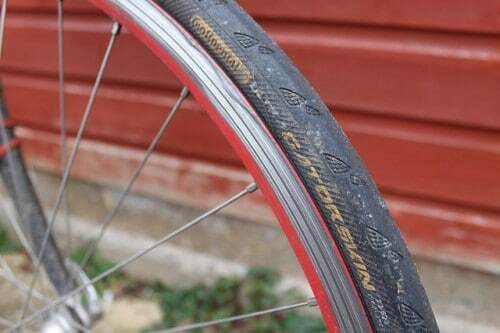 Having examined all the lowest rolling resistance tyres, there’s a lot to be said for just leaving your winter road tyres on your training bike. Given the state of the road, I tend to prefer a heavier, tough road tyre at least on my rear wheel. Unless you’re racing or competitively riding sportives, there isn’t a huge difference in terms of performance. On the other hand, it is nice to feel the lowest rolling resistance. But, if you are more conservative, these tyres offer very good puncture protection. The Gatorskin is a good solid all-rounder. It is easy to put on. Good puncture resistance, and has reasonably smooth rolling resistance. It is quite light given levels of puncture resistance. 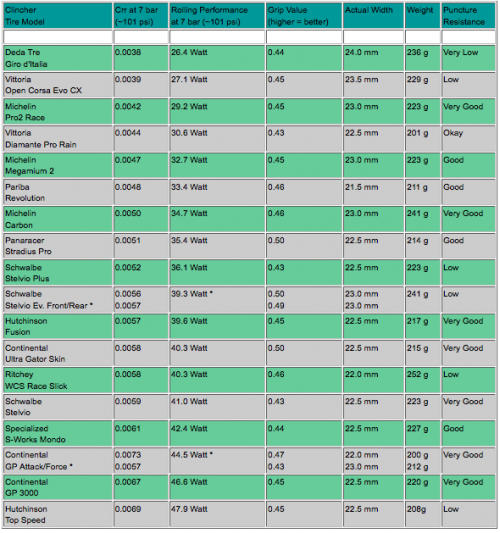 (23″ only 230 gram and 25″ 250gram) I’ve had current pair on for nearly a year, and is showing remarkably little wear. There feels little incentive to change just for upcoming season. 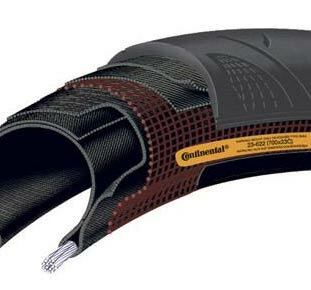 The Gatorskin Hardshell is an extra 50 grams or so to give even better puncture protection. But, for summer, I would choose the lighter Gatorskin. This is a tyre for those who don’t care for rolling resistance, but really want to limit punctures. You definitely notice the difference to a lighter road tyre. They are heavier, and the rubber is quite hard. The hard rubber makes it resistance to cuts and abrasions, but it does mean it rolls slower. 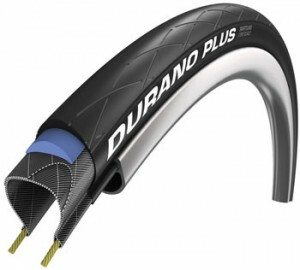 Perhaps the best puncture resistance tyre comes from the Schwalbe Durano Plus. I have these on my commuting tyres and they are almost puncture proof. You can take them on a training bike, though again the extra weight is noticeable. Modern thinking suggests wider tyres can be have less rolling resistance than thinner tyres. This may sound counter intuitive. But, the wider the tyre the less length needs to be in contact with ground. There are many alternative clinchers, but it’s hard to mention them all. 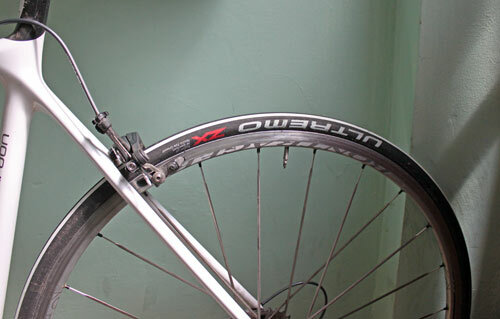 Riding tubulars – generally faster, but more expensive / difficult to mend when you puncture. I think I’d rather ride tubulars than tubeless. But, that’s for another post. After punctures on almost every other ride over a few months, i installed ‘Panaracer Flataway Puncture Protection’ strips in my tyres. Works so far- no punctures in 1000+ miles. On Ultremos currently, which do sometimes wheelspin on the hillclimbs- need to rethink that one!…easier with the info here, thanks! i started cycling 12 weeks ago, after 9 weeks I wanted more. Now traveling from Southern Spain to England. Bought a Bianchi and upgraded to Mavic Yksion Pro wheel and tyre set. I’ve no experience of other tyres but so far I’ve been very pleased. I did nearly 1000 miles before a punctured side wall and that was my own fault for not looking ahead. I was taking in too much of the Spanish scenery. The riding so far has been on good roads with only one day of torrential rain, where I cycled for 4 hours without a stop. Naturally I eased on the speed on twisting long downhills but never once did I feel vulnerable. I have ridden motorcycles on road and raced off road, so I do have adequate experience of drawing some comparisons. So, riding an average of 220 miles per week With a lot of mountains to contend with, I achieve an average speed of 13 mph. I can ride a lot faster over shorter distances and flatter terrain. Up to 30 miles I can average 21 mph. I have averaged 15mph over 51 miles. I’m 45 and haven’t exercised for years. When I started cycling 12 weeks ago I weighed in at 14stb 4lb and now I’m 13 stone. All the data I have supplied demonstrates what a brilliant tyre this Mavic Yksion Pro has been for me.